An experimental technique developed by A*STAR researchers has been used to track the chemical and structural changes in an electrode as a battery discharges. The X-ray-based technique should help to improve the performance of materials in next-generation batteries. Lithium-ion batteries are widely used in our daily lives, for example in mobile devices and electric vehicles. They store and release energy by shuttling lithium ions between two electrodes (see image). But the amount of energy that these electrodes can store, and the speed at which the batteries charge or discharge, is still relatively limited. Moreover, repeated use can cause the electrodes to expand and contract, degrading their performance over time. Electrodes containing titanium dioxide nanotubes organized in a form known as the bronze phase could help to overcome these restrictions because the material has a high theoretical charge capacity and its volume changes little during operation. However, its charging mechanism is not fully understood, due to the limitations of analytical tools that can directly probe the surface charging process. Yonghua Du of the A*STAR Institute of Chemical and Engineering Sciences, and Xiaodong Chen's group at Nanyang Technological University have now tackled this problem by using the Singapore Synchrotron Light Source to perform X-ray absorption spectroscopy measurements on the titanium dioxide electrodes during operation. They discovered that the average charge of the material's titanium atoms, known as their valence state, dropped steadily from roughly four to three as the material accumulated lithium ions during discharge. The experiments also revealed how the material's crystal structure expanded as lithium ions accumulated in the electrode. Since titanium atoms in a low-valence state are slightly larger than ones in a higher valence state, this further distorted the crystal structure. "A phase transition occurs during charging and discharging," explains Du. Different mechanisms for charge storage can occur at the electrode's surface, which the experiments quantified for the first time. They showed that most of the battery's storage capacity depends on the change in titanium's valence state. Further tests demonstrated that hollow titanium dioxide nanotubes could store more charge than nanowires of the same material. 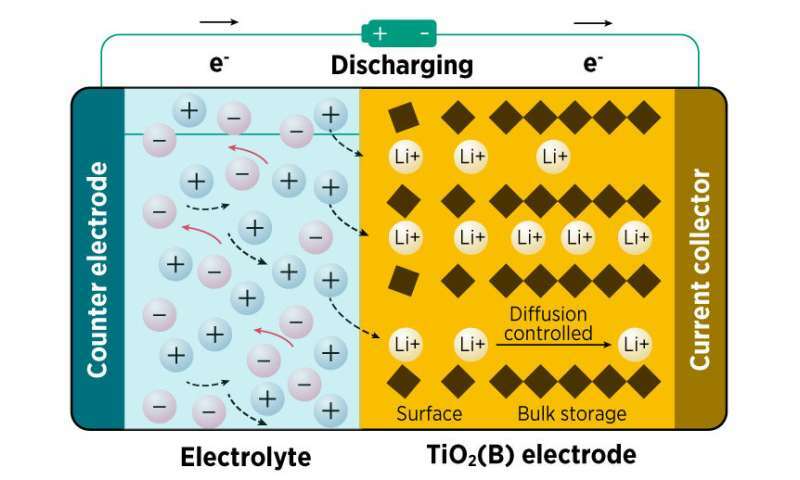 As the discharge rate increased, a greater proportion of lithium ions were stored at the electrode's surface, rather than deep within its structure. This reduced the change in the average valence state of titanium, which ultimately lowered the electrode's energy capacity. This analysis of how the lithium-ion batteries work will help to guide researchers as they design electrode nanostructures to improve lithium-ion storage and mobility. Du notes that their X-ray absorption spectroscopy technique could be also applied to other electrode materials.